The OMB-DBK17 has been discontinued. Please contact our Data Acquisition department for possible substitutes. The OMB-DBK17 simultaneous sample and hold card allows OMEGA’s OMB-LOGBOOK and OMB-DAQBOARD-2000 Series data acquisition systems to capture multiple input channels concurrently in order to eliminate channel-to-channel time skewing. Each OMB-DBK17 provides four channels of differential voltage input to an OMB-LOGBOOK or OMB-DAQBOARD-2000 Series. The sixteen analog input channels of the above data acquisition systems can each accept four OMB-DBK17 cards, for a total of 256 analog input channels with simultaneous sampling. When multiple OMB-DBK17 cards are in use, all channels on all cards are sampled at the same instant. Each of the OMB-DBK17’s four channels features an instrumentation amplifier with switch-selectable gains of x1, 10, 100, 200, and 500. Each channel is also equipped with a location for a user-selected gain resistor, allowing you to select a custom gain up to x500. Each of the instrumentation amplifier input stages is followed by separate sample-and-hold stages whose outputs are connected to an output multiplexer stage. 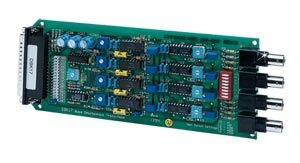 You can connect up to four OMB-DBK17’s to one analog input channel on an OMB-LOGBOOK or OMB-DAQBOARD-2000 Series. The OMB-DBK17 is equipped with BNC input connectors. Its differential inputs are equipped with switchable 100 K bias resistors referenced to analog common.